This weekend, Chris and I, visited my parents house to watch boxing. 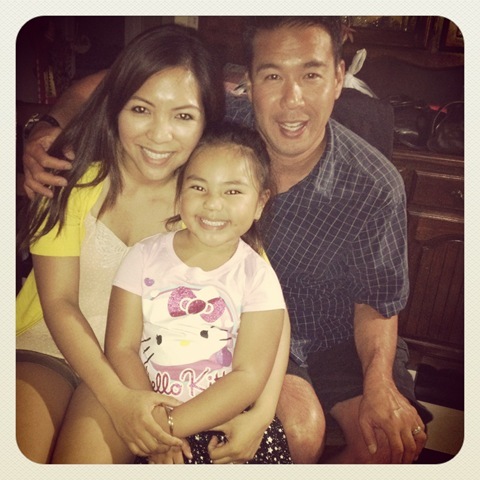 Our family is a big boxing fan and we especially are a big fan of Manny Pacquiao. When we arrived, everyone was still watching the NBA finals, so my niece and I had plenty of time to goofed around. 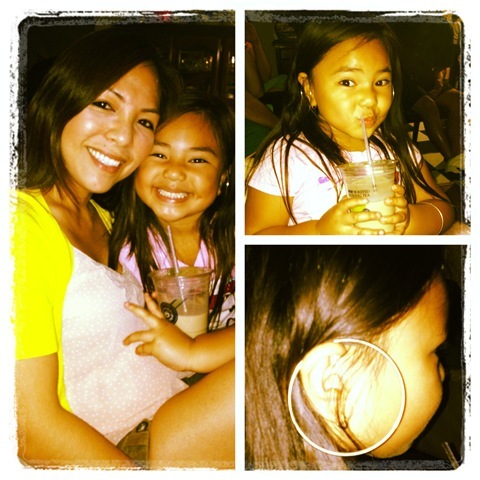 I found her wearing gold bracelets as her earrings. Never a dull moment around her. 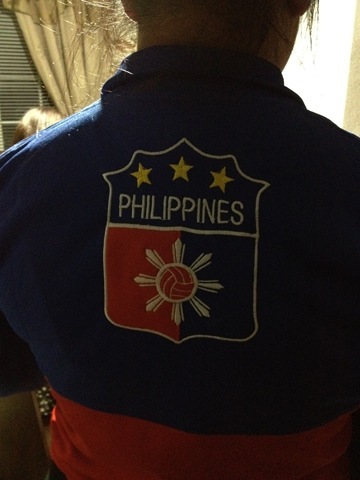 My sister and my dad both wore their “we’re supporting Manny Pacquiao outfits”. 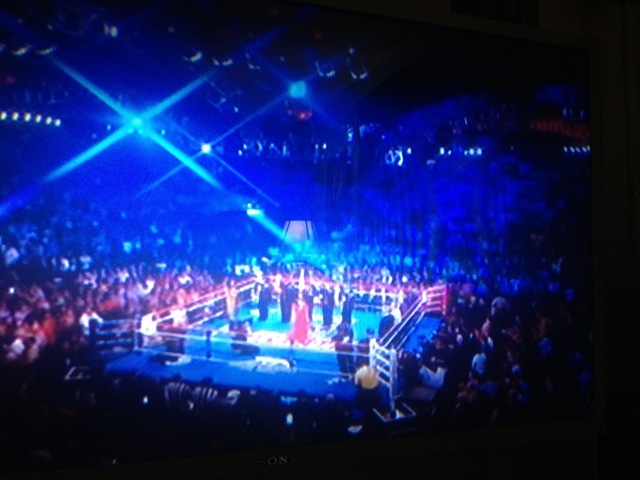 As soon as the fight started, everyone was glued to the television. There were definitely some sad faces after the fight. Then my mom brought out a cake and we turned our frown upside down. 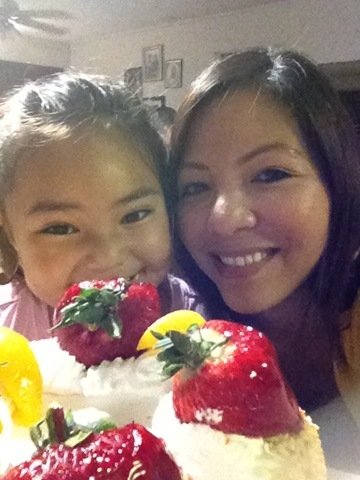 My sister Janell celebrated her birthday last weekend and we celebrated with a cake. 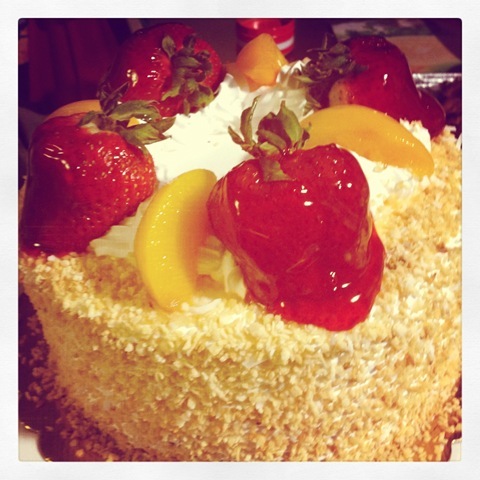 Light and fluffy cake inside, with toasted coconut coating and plenty of fruits. Delicious! We had a great time hanging out with my family. Since I make a batch of quinoa every Sunday, I’ve been incorporating it in my breakfast bowls too. I start with the cooked quinoa and heating it up with almond milk on stove top. I mashed a banana and mix it in the quinoa bowl (natural sweetener). 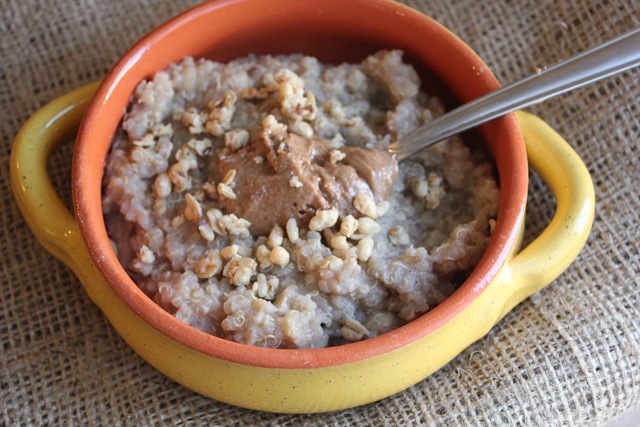 Nut butter and granola as toppings. I always pack lunch for work. 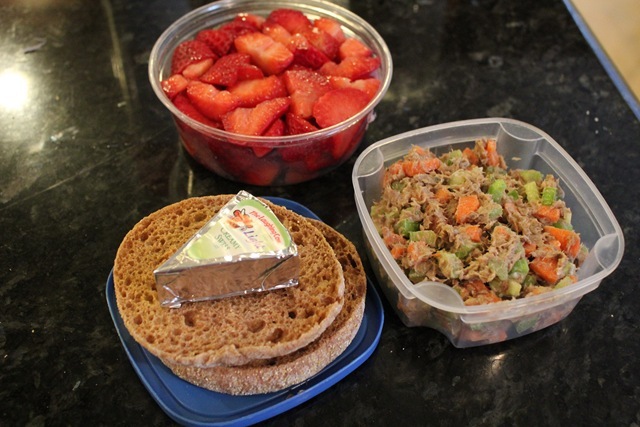 I’ve been enjoying tuna sandwiches on whole grain english muffins and strawberries as my lunch combo. My morning and afternoon snacks. 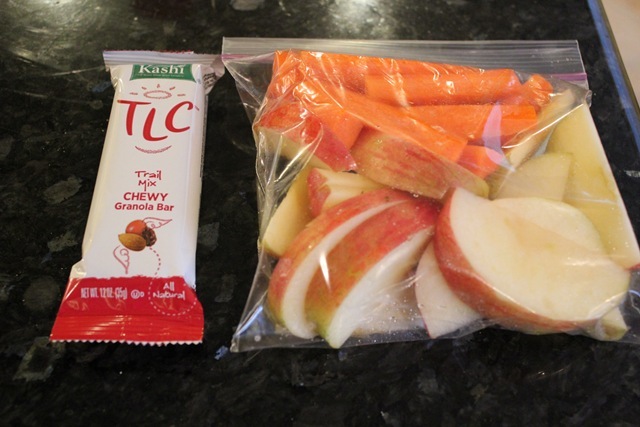 I like having my afternoon tea with fresh fruits and crunch carrots dipped in nut butter. After work snacks (no pictures) –> Pretzels, hummus and dark chocolate. 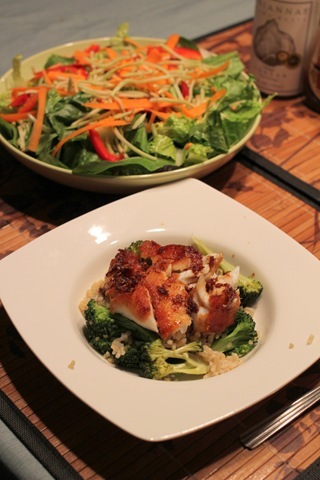 The husband cooked dinner and made one of his fish dishes. 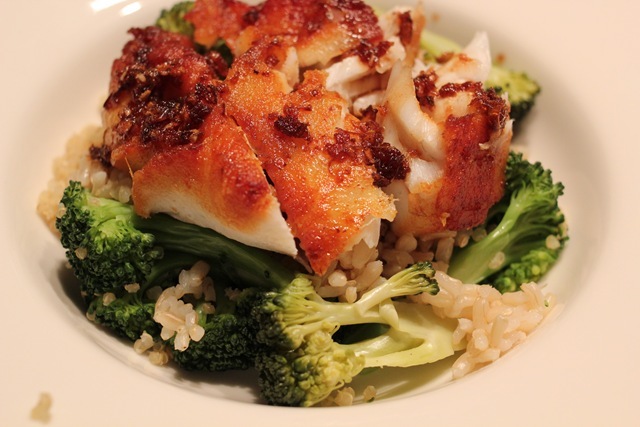 This fresh fish was cooked with garlic and ginger (so flavorful), served on top of brown rice and steamed broccoli. A side salad as our starters. 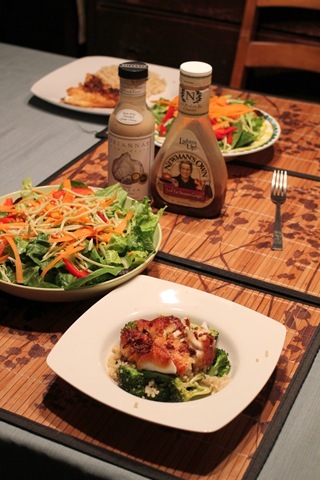 His and hers dinner. Did you watch the boxing fight this weekend? What is your favorite afternoon snack at home/school/work? i love tea at work in the afternoon, but i usually munch all day long. i think i should start having a bigger snack time, so it feels more substantial. 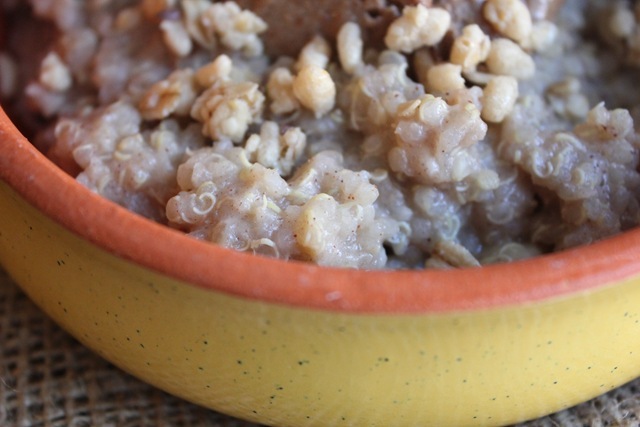 I love quinoa in the morning in place of oats…so healthy, easy and satisfying! OMG! I could not believe they gave the fight to Bradley I was pissed! 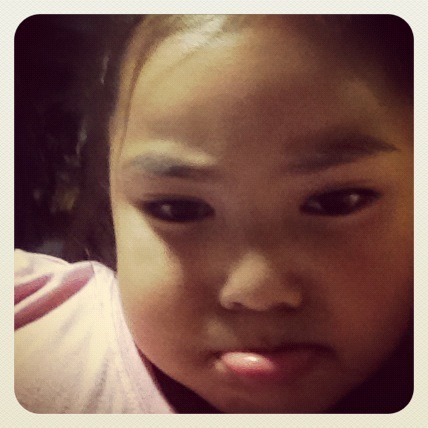 Your niece is the cutest! That cake is gorgeous. What a cute little bowl too! Didn’t watch the boxing match. I don’t think I’ve ever seen a boxing match. My favorite afternoon snack is a fiber bar or hummus!!! That cake looks delicious! Is it from an Asian bakery?